The New York State Environmental Facilities Corporation recently granted $220,000 to the Village of Hoosick Falls to help cover the costs associated with PFOA contamination in the town’s water supply. While village officials are still working to negotiate new settlement agreements with the accused polluters, Saint-Gobain Performance Plastics and Honeywell International, the EFC stepped in to provide funds in the meantime. 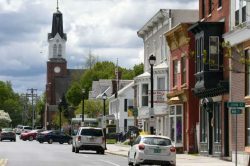 Hoosick Falls officials have tabled both an initial settlement agreement of $850,000 and a revised agreement of $1.045 million after village residents demanded that these deals were not sufficient. “This has given immediate relief to our residents and us. Our small village does not have vast financial resources, and I’d personally like to thank Governor Cuomo and the EFC for their assistance,” said Hoosick Falls Mayor Robert Allen. The terms of the agreement state that if Hoosick Falls reaches an agreement with the companies responsible and receives financial restitution from them, the Village would pay back the EFC’s grant. There is no time limit or interest charge with this agreement. Currently, there is no detection of PFOA in the town’s water supply due to the permanent GAC Filtration System that was installed. However, there is still work to be done, such as finding a new water source and paying for all the costs incurred because of the contamination. Mayor Allen and the Board of Trustees are working with the State Department of Environmental Conservation and the Department of Health to find solutions that minimally impact village taxpayers. Faraci Lange attorneys Stephen Schwarz and Hadley Matarazzo are representing plaintiffs in the Hoosick Falls water contamination class action as Co-Lead Counsel.